In my prior posting, entitled "Ancient Astronauts and Contemporary Skepticism," I challenged the skeptics (assuming they do not want to acknowledge that the Nazca Lines were made to be viewed by an ancient astronaut) to provide a credible explanation of those geoglyphs. I argued that the people of Nazca cannot be considered unique in human history and that the skeptics need to find parallels elsewhere. However, I imagine that, instead of trying to produce a mundane explanation of the Nazca Lines, the skeptics could simply argue that I have not proven the contrary case. The basic facts of the Nazca desert are easy to comprehend. Those large geoglyphs cannot be grasped by humans from the ground; in most cases, the hills or mountains are too distant for anyone to even notice that they are there. The figures on the ground can only be recognized from the air. Since humans were unable to fly until relatively recent times, it is logical to consider extraterrestrials as a potential explanation. I have seen skeptics, in desperation, argue that the people of Nazca, in the sixth century, knew how to make air balloons, but I do not believe it for one second. For whom or for what did the people of Nazca make those ground drawings? Surely, they made those geoglyphs to be viewed by someone or something. That is unquestionable; it is not rational to believe that mass insanity could last the more than one hundred years it took to complete the project. If they made the geoglyphs to be viewed by an ancient astronaut, then where are their drawings of the ancient astronaut? Such drawings do exist. I provide one of them on my website, in a footnote to Gersiane De Brito's "Tiwanaku Alien and Evolution" article. 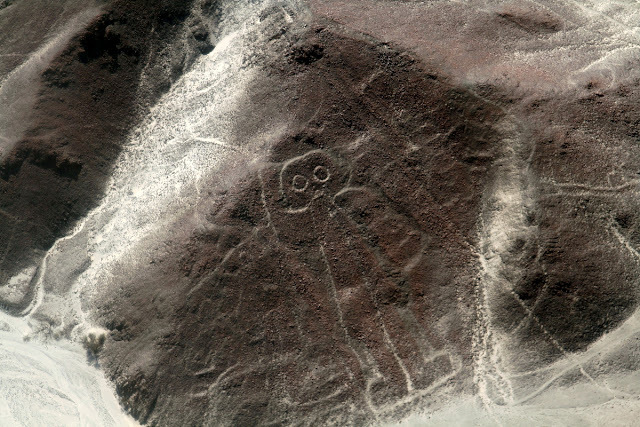 That picture is not a geoglyph, however; it comes from Nazca pottery, but the timing coincides. This makes sense. They likely thought it might be offensive to the alien to draw a picture of the alien on the ground so they only put it on the pottery, where the alien could not see it. Beyond any doubt, the ancient astronaut depicted on the Nazca pottery is the same ancient astronaut depicted in the Tiwanaku engravings. In the Tiwanaku versions, the aquatic, alien nature of the creature is easier to spot. Also in Tiwanaku, with all that bird symbolism, it is apparent that this ancient astronaut could fly, freestyle, up and through the air. Thus, the Nazca Lines have a viable explanation: the geoglyphs were made to be seen by an ancient astronaut that could fly like a bird with the aid of anti-gravity hand-held propulsion devices, without the use of aircraft or spacecraft of any kind. The people of Nazca drew diverse animal figures on the ground to attract the alien's attention and to entertain it, and they drew lines and directional arrows on the ground to lead the alien back to the people of Nazca. I think it times for the world's scientists, archaeologists, anthropologists, psychologists, etcetera, to come to their senses and try to evaluate, objectively, the thinking behind the Nazca geoglyphs. The potential for uncovering an instance of genuine alien contact makes it a worthwhile endeavor.